Please measure your beds air hoses to ensure proper fit. These are made for the 3/8" inside diameter (the opening of the hose). These may help fix a leaky sleepnumber airbed mattress. Often the hose connectors crack and leak air. It's probably one of the most common problems with these great air mattresses. Luckily it can often be fixed easily. 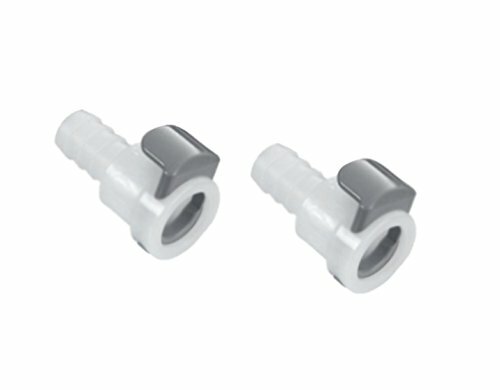 If the connector is broken or cracked these can be used to replace the faulty connector and stop that leak and help get you back to better sleep. Feel around your fittings and see if you can sense air leaking from them. If there is air leaking there is a good chance the fitting has failed. If no noticeable air is felt. The problem could be elsewhere. More often than not it is the connectors that are the problem. Please check to make sure your bed has the 3/8" inch diameter hose fittings. Some beds use a smaller diameter fitting. These will not be compatible with those smaller sized hoses. Fits sleepnumber hoses that have a 3/8" inch inside diameter. Please measure your bed's hose inside diameter to determine if these are the correct size for your bed. If you have any questions about this product by Cpc, contact us by completing and submitting the form below. If you are looking for a specif part number, please include it with your message.